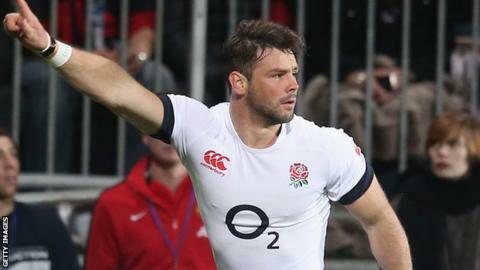 Northampton Saints full-back Ben Foden will miss the rest of the season with a knee injury, putting his World Cup hopes in serious doubt. He went off in Sunday's European Champions Cup win over Ospreys, and will require surgery after rupturing his left anterior cruciate ligament. The 29-year-old, who has won 34 caps, has not featured for England since the 2013 autumn internationals. "Thanks for the support, it's a hard pill to swallow," he tweeted. He added: "Not gonna lie its a hard pill to swallow. I guess it's the nature of the beast #gutted #shouldhavekickedit #onwards." Foden, who has seven international tries, played in England's five matches at the 2011 World Cup but with this year's tournament starting in September, he faces a race against time to be fit. It is the latest in a series of injury blows for Foden, who missed last year's Six Nations with a knee problem, and sat out the 2012 autumn internationals after damaging his ankle. With Mike Brown impressing at full-back, he had been used on the wing in a win against Argentina and a defeat by New Zealand in November 2013, and travelled with the squad for last summer's tour of New Zealand, but did not play in a Test. And even although he was overlooked by Stuart Lancaster for last year's autumn internationals, his form for Saints this season had put him in the reckoning for a Six Nations place. Premiership champions Saints will turn to James Wilson to provide cover at full-back.